Istanbul has been voted the number one tourist destination in the world by users of TripAdvisor. Taking into account millions of independent reviews from people all over the world, the website has recognised the Turkish city as the greatest place to holiday in the world. Cruise1st offers a number of cruises which dock in Istanbul and afford passengers the opportunity to take in the beauty of the largest city in Turkey from the seas. Offering awe-inspiring views of the city that has been shaped by different cultures and civilisations; a cruise into Istanbul is the perfect way to kick start a fantastic holiday. There are a number of interesting and culturally significant sights to see close to the Port of Istanbul. The Sultanahmet District is one of the city’s most popular tourist hotspots, offering an authentic Turkish shopping experience. Comprising of number shopping strips set in historic neighbourhoods, many of the city’s ancient customs are still practised daily. Haggle with market owners for an authentic souvenir. Set back just off the coast, the Sultanahmet District is hugely popular with cruise passengers wanting to get a true taste of Istanbul. Increasingly popular with visitors to Istanbul are the Prince Islands: a set of nine islands just off the coast. With no automobiles on the islands (the preferred mode of transport is horse and cart) there is a relaxed and traditional atmosphere on the island. This makes it hugely peaceful for visitors wanting to escape the hustle and bustle of Istanbul. The Prince Islands are so called because princes and other members of the royal family were exiled there during the Byzantine period, giving it a regal feel. The islands are primarily accessible by sea. Hugely popular with tourists is the Bosphorus cruise which takes in 20 miles of sea along the shore and serves as the physical border between the continents of Europe and Asia. 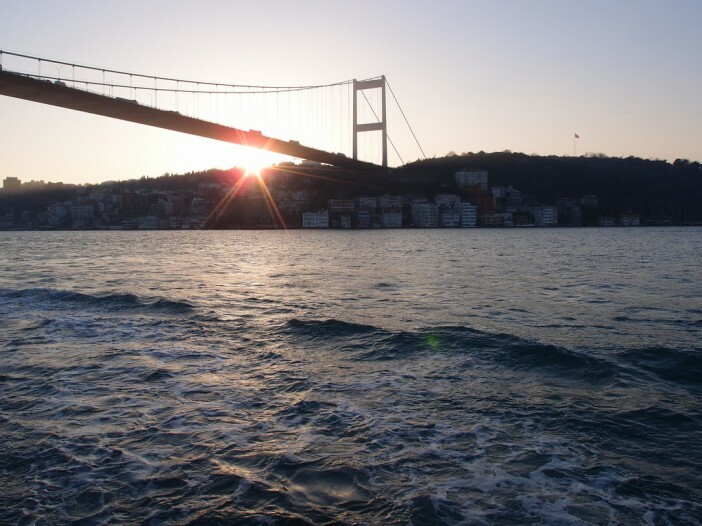 Many of Istanbul’s most beautiful sights can be enjoyed from the luxury of the Bosphorus cruise ship. The natural beauty of the city perfectly complements the unique architecture of the different civilisations that have inhabited Istanbul. Being located on the Eurasian divide ensures that Istanbul has always been a city of religious significance. The Blue Mosque is popular with people both of the faith and not of the faith due to its cultural significance and outstanding beauty. Officially known as the Sultanahmet Mosque, the structure was given its nickname thanks to the blue tiling on the walls. Solar Beach on Istanbul’s coast offers a number of fantastic water sports for visitors of all ages and abilities to engage in. If riding a Jet Ski on the waves seems like too much hard work for a holiday, the beach contains great stretches of sand for you to just lounge about and enjoy the views. Solar Beach is also hugely popular with tourists wanting to watch the sun go down on Europe.